Having frozen cookie dough on hand is nice for those days when you get a craving or if you have some unexpected guests pop by. Freshly baked cookies are so welcoming. Recently I mixed up three batches of my favorite cookies, formed in to balls, and popped into the freezer. FUNNY STORY: My youngest daughter got to eat lunch with her teacher today. She was very excited about this. I had an early morning doctor appointment so I wasn’t home to pack her lunch. No biggie she usually packs her own lunch every day anyway. Apparently she asked her father if she could have a cookie for lunch. He said sure since it was a special lunch day for her. When it was time to leave he went over and looked at her lunch. In it she had TWO raw cookie dough balls! She thought she could just eat them that way. This story made me laugh when I got home. He had her put the cookie dough away and she got to take two squares from a Hershey’s bar instead. She is just too sweet! This cookie dough DOES contain eggs so they MUST be baked! The texture of the cookies changes slightly baked this way. They are a little puffier and denser. In a mixing bowl cream together butter, brown sugar, and white sugar. Add eggs one at a time. Scrape down bowl as needed. With a wooden spoon mix in baking chips. Using ice cream scooper scoop up balls of cookie dough and place on a parchment lined cookie sheet. Pop in the freezer for 8 hours or over night. Place the frozen cookie dough balls in a freezer bag and store until the craving strikes. Preheat oven to 375 degrees Line baking sheet with parchment or silpat. 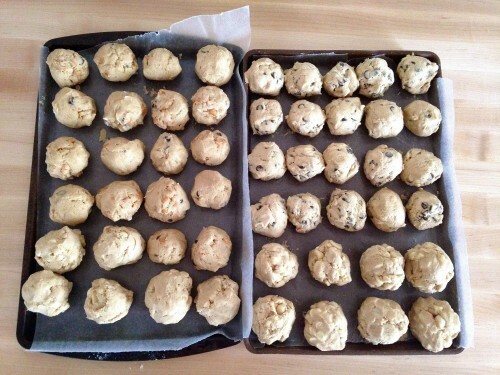 Place frozen cookie dough balls on sheet about 2 inches apart. Bake for 15 minutes. Those look yummy! Your daughter is too cute! This is such a great idea. 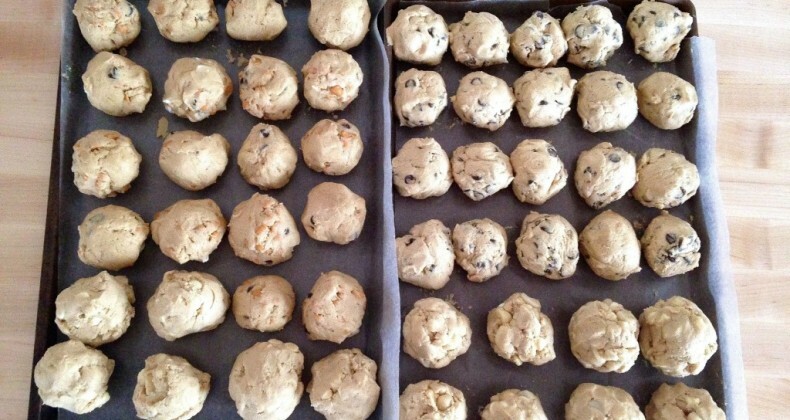 I love to have cookie dough balls in the freezer so I can make up warm, homemade cookies with no effort!